There’s a total of 4,190m of climbing over the 138km Maratona dles Dolomites course. Your holiday pictures will be full of the classic Dolomites scenery after your Maratona dles Dolomites cycling holiday. 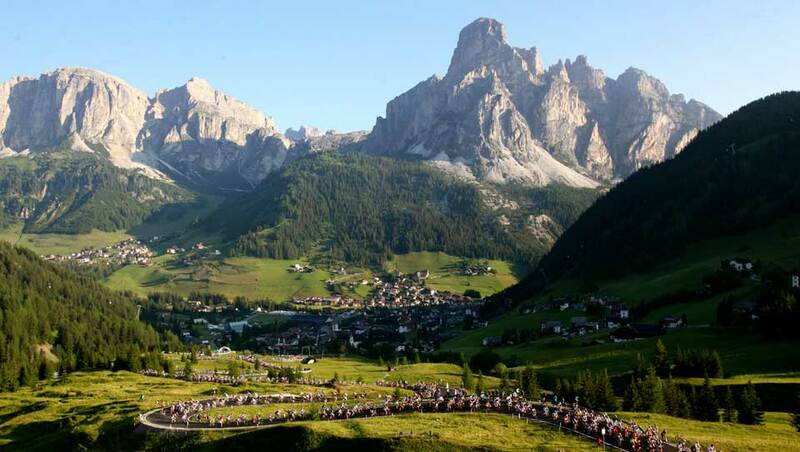 The Maratona dles Dolomites is a beautiful granfondo on a testing course in the Italian Dolomites mountain range. The full 138km Maratona course takes riders over five 2,000m+ passes and the saw tooth profile means you are either ascending or descending throughout the day. The readers of Cycling Weekly rated the Maratona dles Dolomites 3rd favorite international sportive behind the Etape du Tour and La Marmotte. Looming large on the course profile are the Passo Giau (2,236m over 9.9km at 9.3%) and Passo Valparola (2,200m over 11.5km at 5.8%); make no mistake this is right up there with La Marmotte and Nove Colli for difficulty. For many cyclists the Maratona is a ‘must do’ and it’s proximity to Venice and the Adriatic coast means a Maratona dles Dolomites Cycling Holiday can be combined with some sightseeing too. There are three sportive distances to choose from including the full Gran Fondo “Maratona” length course. All of the routes start at La Villa and finish at Corvara, so you will not miss any of the pre or post race atmosphere if you choose to take on one of the shorter distances. As you can imagine cycling in the Dolomites involves plenty of climbing and the saw tooth profiles are testament to how challenging this gran fondo is! The 138km Maratona dles Dolomites course is a who’s who of famous Italian Dolomites climbs. Brevet’s Maratona dles Dolomites Cycling Holiday includes a route recce on the famous Sella Ronda course as well as a great day out climbing the infamous Passo Giau. Our fully supported tour includes a 6:1 client to guide ratio and support from a team car on all training rides in the days building up to Maratona 2016. Places for the Maratona sell out immediately. At Brevet we have a limited number of guaranteed Maratona 2016 entries. A quick look at the course profile welcomes you nicely to the reality of cycling in the mountains. The Dolomites provide an inspirational backdrop to this gran fondo and training consistently in advance of the big day will help you appreciate the views more. The key to cycling up (and down) challenging mountain cols is experience. There are many long steady hills in the Maratona and it’s essential to build up experience of ascending climbs for up to 60 minutes at a steady, controllable cadence. Descending should also not be underestimated and it’s a good idea to focus on your descents rather than just using it as a freewheel recovery. Practicing lines around corners, refueling with water and energy products and getting in some back and leg stretches are all useful exercises to practice in advance so that you descend safely and intelligently come race day. When you are in training for a challenging sportive it is very important to be consistent. Your body will adjust best to consistent training efforts, making continual improvements and changes if you train and rest consistently. 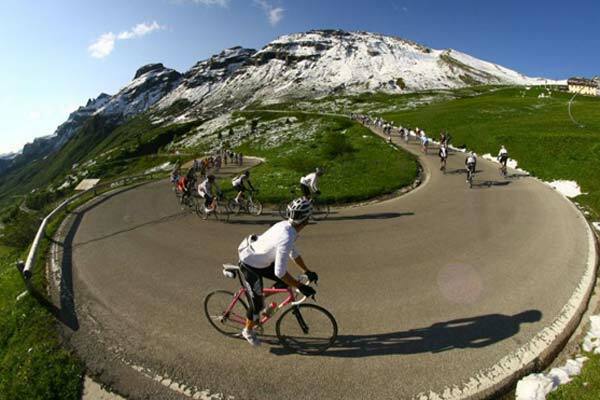 Book your Maratona dles Dolomites Cycling Holiday before places run out!